I'm back. So much has happened since my last post, too much perhaps to fit into this one entry. Suffice it to say there have been a lot of ups, a lot of downs, and certainly a ton of learning and growth. And that's the important thing isn't it? So instead of boring you the details of the past year, let's focus on NOW. In every adversity lies a seed of wisdom, lessons that can move us towards greater understanding of life. So in the spirit of this blog and to get us reacquainted with one another once again, let's use this first entry back to talk about what I've been reading. I started the year off with a real thirst for learning. While I never fully lapse from reading, in 2015 I did slow down quite a bit. And having gone through the shits like I did, I knew I had to get back on the reading wagon or risk having a repeat of last year. No thanks. And tonight, I just finished The Power of Broke by FUBU founder and Shark Tank panelist Daymond John. I had really become a big fan of the show Shark Tank, binge watching one season after the next sometimes going through 3 or 4 episodes a night. What drew me into the show was being able to get a peak into the thought process of these über successful individuals, these "sharks". And I wanted more. So I searched to see if any of the panelist had written any books and immediately put them on my reading queue... notice that Robert Herjavec's Will to Win is also on the list. Ronnie's success lesson: Find people who have the results you want, and go figure out what they know. The verdict? The Power of Broke was everything I'd hoped for and more! In this book, Daymond shares the profiles of success stories from a broad spectrum of fields including his own. He weaves a common thread through each story spotlighting the principle that pushed each person from good to GREAT and beyond — namely THE POWER OF BROKE. What is the power of broke? The way I see it, if (or when) your back is up against the wall, it's knowing that anything is possible and that you just have to dig deep, push forward, and trust that you can and will come out on top. It's everything this blog is all about. That's why I love this book. That's why you need to get yourself a copy immediately. BONUS TIP: In the Power of Broke, Daymond mentioned that he reads a certain book once a year, a book that he places tremendous value on, a book that changed his life, a book that I LOVE and has impacted my life in much the same way. And you know what? 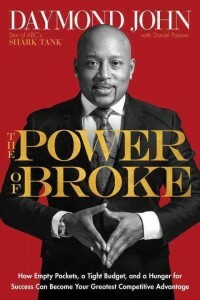 just like me, Daymond reads this book once a year. Remember the success lesson for this post: Find people who have the results you want, and go figure out what they know. Well, now you know at least two people who read Think and Grow Rich once a year.